In 1986, the line-up of singer and guitarist Clint Mansell, guitarist and keyboardist Adam Mole, bassist Richard March, and drummer Graham Crabb formed as Wild And Wandering in the English town of Stourbridge. After some months and one e.p. 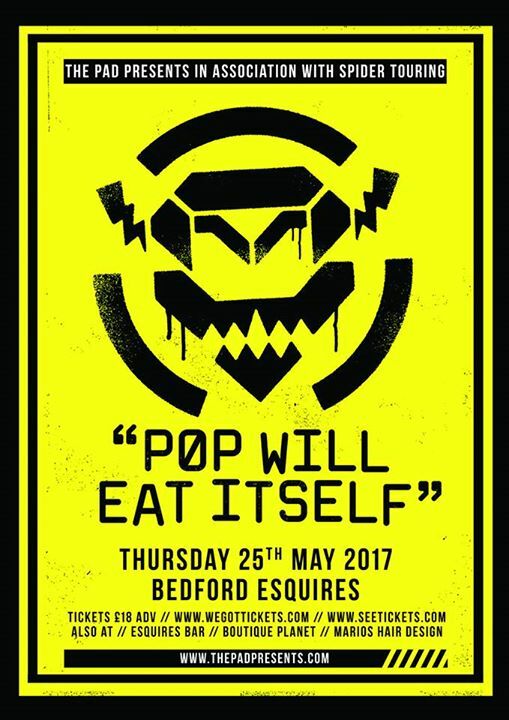 they changed their name to Pop Will Eat Itself (PWEI) and earned attention from the indie scene for their first e.p., The Poppies Say Grrr! on Chapter 22. At the time they played short, fast, slightly psychedelic punk-pop tunes and went on with that for three more e.p.’s before starting to incorporate house and hip hop beats and samples on Beaver Patrol. By autumn 1987 PWEI released their first album, Box Frenzy, with some tunes leaning towards new wave, some towards hip hop and acid house. A drum machine called Dr. Nightmare was installed and Graham Crabb took the second microphone. After the 12″ Def.Con.One PWEI signed a deal with RCA and released Can U Dig It? in 1989, which would be the first of 12 PWEI singles going UK top 40. In the same year their seminal second album This Is The Day…This Is The Hour…This Is This! appeared to public and critical acclaim for its witty fusion of rock and electronic music. PWEI opted for an even more electronic, slightly darker and moodier approach on Cure For Sanity, their third album, which appeared in 1990 alongside PWEI’s alternative soccer world cup theme, Touched By The Hand Of Cicciolina, a fusion of dub and acid house. Electronics took a backseat on 1992’s The Looks Or The Lifestyle, when Fuzz Townshend was brought in as a drummer. PWEI reinvented themselves as grungy groovers and released Get The Girl! Kill The Baddies! as their highlight single. PWEI had been sacked by RCA at the time the single went number 9 in the UK in early 1993. The band signed with Infectious in the UK and Nothing in the US and released R.S.V.P., Ich Bin Ein Auslander, and Everything’s Cool as singles in 1993 and 1994. The tunes displayed a development from where they had left towards dark industrial rock. The mixture on their fifth album Dos Dedos Mis Amigos was received well and won the band many new fans. Nonetheless, the band only released the remix album Two Fingers My Friends after that and collapsed upon the departure of Graham Crabb in 1996. Crabb released an album as Golden Claw Musics, Richard March went on to form Bentley Rhythm Ace, Fuzz Townshend went solo, and Clint Mansell has done film soundtracks. In 2005, a reunion tour and new songs were announced, but the reformation fizzled out by the end of the year. In 2010, in the wake of the dissolution of Vile Evils, Graham Crabb announced his intention to reconstitute PWEI. By 2011, Crabb had recruited new band members, and PWEI released a new album, New Noise Designed By A Sadist, and went on tour. Tickets are on sale priced £18 advance from 9am on Friday 9th November from Seetickets and We Got Tickets and can also be picked up in person from Bedford Esquires Bar, Planet Boutique, Mario’s hair Design Kempston and Vinyl Revelations in Luton.